Picky eating is one of the most common complaints about toddlers, preschoolers, and young kids. But you CAN make it better! This is part of a series on picky eating where I’ll be sharing different strategies to reduce picky eating and make mealtimes a little easier. I still gave him his regular breakfast – I just didn’t say the word “breakfast” again – but it made me think about how much more excited he gets for snack time than meal time. Kids learn EARLY that snack foods can be so much more fun and delicious than meal foods. And it makes sense. Who would want to eat a plate of chicken, broccoli, and rice if they knew they could just eat a bunch of Pirate’s Booty or Goldfish instead? You might be thinking, well if I just never let my kids eat any of those snack foods then it will be fine and they will happily eat whatever I give them. I wish it were that easy! For sure, I don’t recommend giving your baby/toddler sugary snack foods under 1 year old – and you really can easily avoid it at that age. But as they become toddlers, it gets a lot harder. If they go to daycare or school, over a friend’s house, to a birthday party… there are going to be snacks and treats provided. Side note: What is it with everyone wanting to give my kid a lollipop? I’m not even kidding you, we were leaving the pediatrician’s office which is in a big med park so they have a valet available, and the guy just hands Teddy a lollipop as we’re walking out. You guys…it was 8am! It was a small treat but now my son randomly asks me for a lollipop every time we go anywhere that resembles a doctor’s office. This is so common, and it’s not your fault! But if you’re ready to make a change, here is what you can do. 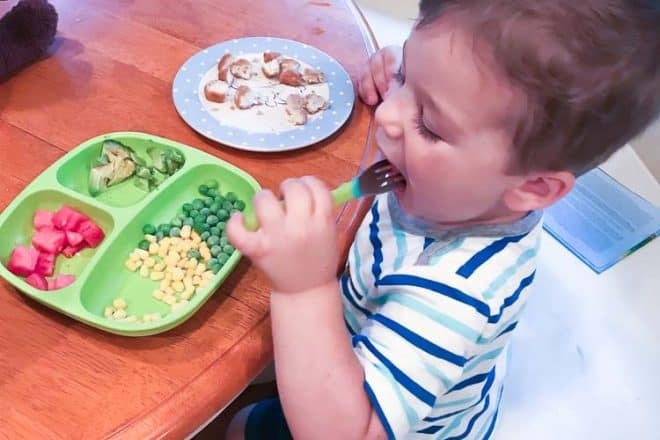 The #1 most important thing parents can do to cut down on picky eating and limit excessive snacking is to establish regular meal and snack times. This is important because it tells each of you what to expect. Kids learn that these are the times when we eat. Not whenever they feel like it. And, you as the parent know that you are offering plenty of opportunities for them to eat. That means that when they ask for a snack outside of these times, you can feel OK about saying no. If they’re a little older, you can tell them that it’s not meal/snack time and we’ll be eating in an hour or whenever the next time is. You may also suggest an alternate activity or offer a glass of water. You can ask if they want to help you prepare the next meal when it’s time. Even if your child is truly hungry when they are asking for a snack, it is okay for them to feel hungry for a little while. I am going to say that again, because most parents have a hard time with it. If you’re sticking to a regular meal schedule, hunger is not an emergency. Children need to learn, over time, how much food their body needs at one time. They don’t learn that mealtimes are when we fill up, if they know they can eat a snack any time they feel a little bit hungry. Don’t keep a smorgasboard of snacks in the house! I know it’s easy to fall into having a cupboard full of snacks, because we want to give our kids what they like and what we know they will eat. It’s not realistic to completely ban all these kinds of foods from your house, nor do I think it’s healthy to. But be reasonable. If there’s no Doritos in the house, then sorry, we don’t have any. Your kid will eat something that’s available if they are really hungry. I had a client at one of my internships who came in saying that her son will ONLY drink Coke and will ONLY eat muffins/cookies/candy. I don’t mean to sound harsh, but as the parent, you have the choice over what you bring into the house. So you have to ask yourself this question. “What would happen if there was no soda/cookies/whatever in the house?” Will something bad happen? Would it hurt to try? It’s not easy. You may endure a meltdown or two. You may have a cranky kid for a few hours because they want to have their way. But wouldn’t you rather deal with this a handful of times and put it in the past, than have to deal with it every single day when they are constantly asking for snacks? These are just two of many strategies to cut down on picky eating. Do you enforce these rules in your house? Is this something you’d like to improve on? This toddler tornado of mine eats so little stuff. Most of the time we have to pretend to take his food away and eat it ourselves before he’ll even eat haha. I try to get healthy options for snacks so at least he gets his veggies hidden in. Haha it is so hard with toddlers to keep them interested in eating when there’s so many other fun things they rather be doing. Their appetite takes a natural dip around this age too so they just don’t care about eating that much in general!